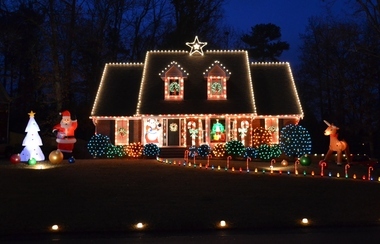 Decorate your house with lights for the Holidays and win fabulous prizes at local area businesses. The Contest starts December 1 with judging on December 21. The Holiday Lights Contest is open to anyone living in the City of Toledo and in these parts of the Greater Toledo Community: North of Toledo to Tucker Rd to Schoolhouse Lane to Spencer Rd and back to Toledo South of Toledo to the Cowlitz County Line East of Toledo to Collins/Eadon Road loop & Kangas/Salmon Creek Road loop. West of Toledo to I-5. All participating houses outside of town must be located on an established school bus route and must be visible for judging from a school bus. Judging will take place from 5:30 to 7:30 pm on Monday December 21. Winners will be announced at a community gathering at Toledo High School that evening. Toledo Light Tour: At 5:30 pm on Monday, December 21, a school bus will leave Toledo High School with as many passengers as will legally fit. The bus riders will head out of Toledo to the various sites to see the lights and to vote for their favorites. At the same time a hay wagon will leave the high school with folks heading down into town to see the lights and to vote for their favorites. The vehicles will return to Toledo High School by 7:30 pm to join in a community gathering with cookies, coffee, and music, and the winners will be announced. To Enter the contest, email your physical address (We need your address so we can find your house. It is for Judging purposes only. ), name, and phone number to: mike@morganartscentre.com Alternatively you can fill out a form and turn it into City Hall. Entry forms can be found at many businesses around town as well as City Hall. Completed Entry Forms must be turned in to City Hall or emailed no later than 5 pm Thursday, December 17.